New Bremen Mayor Jeff Pape addresses the crowd during the State of the Villages breakfast Thursday morning in New Knoxville. It was a full house for the annual State of the Villages breakfast held in New Knoxville Thursday morning. It was a full house for the annual State of the Villages breakfast held in New Knoxville Thursday morning. Logan O’Neill, SWACCC executive director, talks about the importance of holding the State of the Villages breakfast every year. 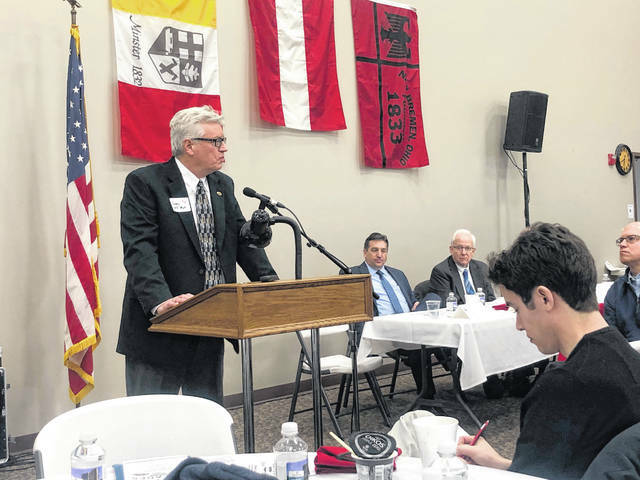 NEW KNOXVILLE – The mayors of New Bremen, New Knoxville, and Minster spoke of positive progress at the 26th annual State of the Villages event held Thursday by the Southwestern Auglaize County Chamber of Commerce (SWACCC) at the First Church in New Knoxville Ohio. New Bremen Mayor Jeff Pape said positive events in 2018 included Crown Equipment’s erection of a 500,000-square-foot addition on 22 acres of ground. He said the completion of the Front Street/Eastmoor Drive has resulted in great improvement to that section of town and thanked his council for having the foresight to take the waste soil from the construction site and use it to form a sledding hill at the park. He also thanked Diane Komminsk for the snow-making machine installed there. Pape said village administrator’s Christine Dicke’s implementation of a software program will allow the village to track expenses and activities. Also, Dicke’s project to clear Weirth Ditch has greatly improved drainage. Their future plans include securing Ohio Public Works funding to improve Ash and Franklin streets. Other future projects are participation in building the Miami Erie Fitness trail. New Knoxville Mayor Keith Leffel said Crown Equipment had also invested in their community, with an expansion that almost doubled their facility on 36 acres of ground annexed by the village. He pointed out the expanding housing available with the completion of Northfield Estates. He said there were 13 building permits issued worth $5.6 million. He said the completion of the sewer and water lines out to Neil Armstrong Airport had allowed annexing property along the way. In 2019, they plan to update downtown signage and lighting. Street cameras have already be added to increase security. He said they also plan to expand Buckeye Street into the industrial park to add more frontage. Finally, Leffler also credited the village staff with doing their best work. The volunteer fire department/emergency service answered 115 calls, 82 for medical emergencies and 17 for fire. Minster Mayor Dennis Kitzmiller pointed out the development of a new 32-acre industrial park along state Route 66 was done in part by village employees, which saved the village money. He said one business has already set up there. Another accomplishment was the passage of a 3 mill, 3-year levy to fund the Fire and EMS departments in the village and Jackson Township. In 2019, the mayor said their new Northeast Electrical substation will be completed, replacing the current 50-year-old building. He said much of the effort on their project is also done by employees. Their next major street project, a $2 million upgrade of Fifth Street, which will rebuild water and sewer lines, build new roadbed, and sidewalks, will also relieve drainage issues and accommodate new residential subdivisions. Kitzmiller also said 2019 the Half Moon solar power company plans to spend $170,000 on expansion. He said this power source had saved the village money in regards to transmission and capacity. Other signs of investment included 33 building permits worth $5.5 million, five of which were for industrial development. Also speaking at the event was State Sen. Matt Huffman and, via video recordings, U.S. Sen. Sherrod Brown, U.S. Rep. Jim Jordan. O’Neill said that the entire program from Thursday would be replayed on NKTelco channel 3.
https://www.sidneydailynews.com/wp-content/uploads/sites/47/2019/01/web1_1mayor-pape-at-podium-leffler-and-kitzmiller-1.jpgNew Bremen Mayor Jeff Pape addresses the crowd during the State of the Villages breakfast Thursday morning in New Knoxville. 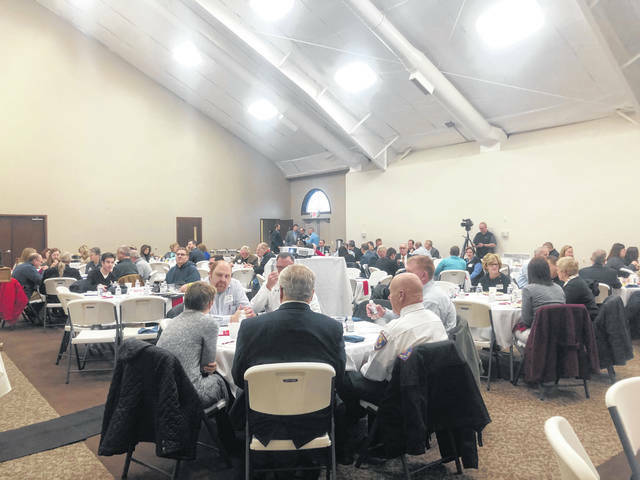 https://www.sidneydailynews.com/wp-content/uploads/sites/47/2019/01/web1_3crowd-1.jpgIt was a full house for the annual State of the Villages breakfast held in New Knoxville Thursday morning. It was a full house for the annual State of the Villages breakfast held in New Knoxville Thursday morning. 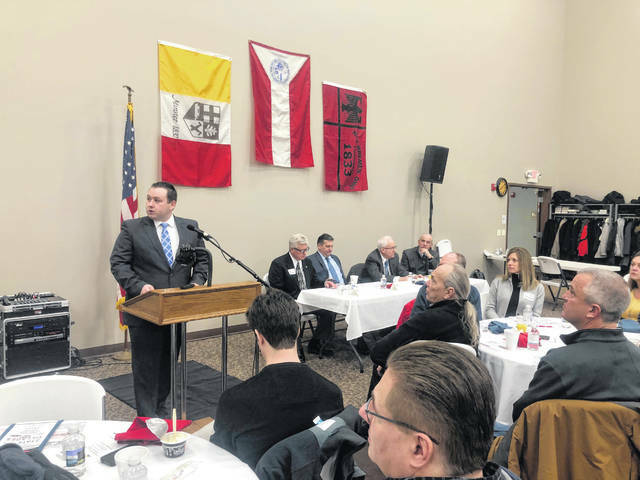 https://www.sidneydailynews.com/wp-content/uploads/sites/47/2019/01/web1_2oneil-at-podim-mayor-jeff-pape-keith-leffler-dennis-kitzmiller-and-matt-huffman-1.jpgLogan O’Neill, SWACCC executive director, talks about the importance of holding the State of the Villages breakfast every year.